Salisbury, MD: It’s that time of year again! Time to ring in the New Year in Downtown Salisbury with the 6th Annual New Year’s Eve Ball Drop, presented by Gillis Gilkerson. Rev up those noisemakers and get ready for a night filled with live music by AMP Studios and the Tops Cut Off DJ Team, plus giveaways and confetti at midnight! The event is on Monday, December 31, 2018 from 9-midnight, and is a free, all-ages, family-friendly event. The Ball Drop will be located at the intersection of Main Street and N. Division Street in Downtown Salisbury, with a 4.5-foot-wide ball lowered by a Salisbury Fire Department tower truck. The outdoor stage will feature a huge jumbo-tron countdown screen plus confetti and a ball drop at midnight. Beer, wine and champagne will be available for purchase outside. Warm drinks and snacks will also be available from local food trucks like East Town Eats and the Hot Dog Truck. Free parking will be available in lot one and in the parking garage. 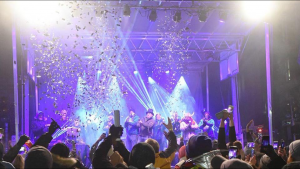 New Year’s Eve SBY Ball Drop is produced by The Salisbury Arts & Entertainment District on behalf of The City of Salisbury. The event would not be possible without the support of our local sponsors, including Gillis Gilkerson, Kuhn’s Jewelers, The Insurance Market, 47-ABC and iHeart Media / Froggy 99.9. Very special thanks to the City of Salisbury, City of Salisbury Field Operations, Salisbury Police Department, Salisbury Fire Department, and all our local volunteers!